Incarcerated individuals in Arizona's local, state, and federal prisons require qualified corrections officers that are professional and treat offenders within safe and humane guidelines, as well as provide opportunities for reform every day. Arizona has some of the largest facilities in the United States and therefore the need for both male and female correctional workers is ongoing. Currently, the state employs just over 9,800 officers across its 16 facilities, which house 39,062 inmates. Correctional facilities in Arizona are either state-owned, like Yuma, Winslow, and Tucson State Prisons, or are under contract from the state to private enterprises, such as Central Arizona Correctional Facility, Marana, and the Red Rock Correctional Center. Regardless, information concerning each facility and employment opportunities can be found on the state's Department of Corrections website. The Bureau of Labor Statistics outlines that job growth is steady at 5% over the next decade, and ample employment opportunities abound as states outsource more prison facilities to third-party companies and move to fill internal gaps left by retiring or promoted officers. The need for correctional workers in community services capacities is also expected to grow. Read more information about the industry below. Since 1997, the educational service partnership between Rio Salado College and the Arizona Department of Corrections has helped more than 13,000 individuals earn a certificate of completion in Law Enforcement Technology Basic Corrections. Upon completion of the program, basic corrections students earn 21 college credits while on the job. As program completers, they are well on their way toward completing an Associate in Applied Sciences (AAS) in Corrections degree, which is beneficial for those seeking promotion or career advancement. Rio Salado has an appointed staff member called a “navigator” to further assist corrections officers in reaching the goal of earning an AAS, which can be completed online through Rio Salado. Like other industries, the criminal justice field is facing challenges relating to recruitment and retention of qualified personnel, especially now, as they compete with other criminal justice fields such as law enforcement or private security. Rio Salado is committed to helping the corrections industry meet the demands of finding qualified employees, the success of its Basic Corrections program and ultimately, degree completion for all students. Arizona State University-Skysong ranks 2nd in our rankings with 140 students completing programs in law enforcement administration out of a total two thousand students in the 2012-2013 school year. Coconino Community College ranks 3rd in our rankings with 14 students graduating from programs in law enforcement administration and corrections out of a total 568 students from the 2012-2013 school year. 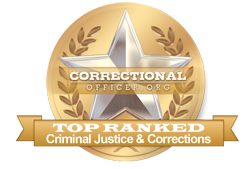 Arizona Western College ranks 4th in our rankings with sixty-nine students completing programs in corrections and law enforcement administration out of a total three thousand students in the 2012-2013 school year. Yavapai College ranks 5th in our latest rankings with forty-nine students graduating from programs in law enforcement administration and criminal justice out of a total 2,660 students in the 2012-2013 school year. Recruits who have successfully passed all proof-requirements and screenings up to this point will be placed in a new-candidate hiring pool to be drawn upon as the need arises due to veteran officers' advancement or retirement. As positions become available throughout the state, candidates will be contacted to submit proof of a final negative drug test, and as such, arrangements will be made for correctional officer academy training to begin. The state of Arizona is committed to serve and support correctional facilities in the state by encouraging growth in the field. To this end, the median income for front-line correctional officers throughout the state is slightly lower at $38,300 than the median national income of $39,800, which translates to less than $1 per hour difference. CareerInfoNet.org has published state and national trends at http://www.careerinfonet.org/occ_rep.asp?next=occ_rep&Level=&optstatus=011000000&jobfam=33&id=1&nodeid=2&soccode=333012&menuMode=&stfips=04&x=33&y=9 which predict that growth in Arizona at 13% from now until 2022 vastly outstrips the national growth trend of 5%. The predicted job growth translates into approximately 510 jobs in the form of newly created openings and existing vacancies over the next decade. The table below lists career information retrieved from the Bureau of Labor Statistics for correctional officers in Arizona. The table is sorted by total employment, with the largest metropolitan areas listed first.